“Thanks to that [Goldfinger’s] work, we now know that the Pacific Northwest has experienced 41 subduction-zone earthquakes in the past 10,000 years. If you divide 10,000 by 41, you get 243, which is Cascadia’s recurrence interval: the average amount of time that elapses between earthquakes. That timespan is dangerous both because it is too long—long enough for us to unwittingly build an entire civilization on top of our continent’s worst fault line—and because it is not long enough. Counting from the earthquake of 1700, we are now 315 years into a 243 year cycle. The combined stratigraphic correlations, hemipelagic analysis, and 14C framework suggest that the Cascadia margin has three rupture modes: (1) 19–20 full-length or nearly full length ruptures; (2) 3 or 4 ruptures comprising the southern 50–70 percent of the margin; and (3) 18–20 smaller southern-margin ruptures during the past 10 k.y., with the possibility of additional southern-margin events that are presently uncorrelated. The shorter rupture extents and thinner turbidites of the southern margin correspond well with spatial extents interpreted from the limited onshore paleoseismic record, supporting margin segmentation of southern Cascadia. The sequence of 41 events defines an average recurrence period for the southern Cascadia margin of ~240 years during the past 10 k.y. If so, then we can transform one of her scariest sentences into something substantially less terrifying: “Counting from the earthquake of 1700, we are now 315 years into a 243 417 year cycle.” So, on average we shouldn’t expect a big or really big earthquake for another 100 years or so. Yellow text show (simple average) recurrence times for different inferred segments of the full-rupture patch of the Cascadia Subduction Zone. Time-independent probabilities for segmented ruptures range from 7–12 percent in 50 years for full or nearly full margin ruptures to ~21 percent in 50 years for a southern-margin rupture. Time-dependent probabilities are similar for northern margin events at ~7–12 percent and 37–42 percent in 50 years for the southern margin. 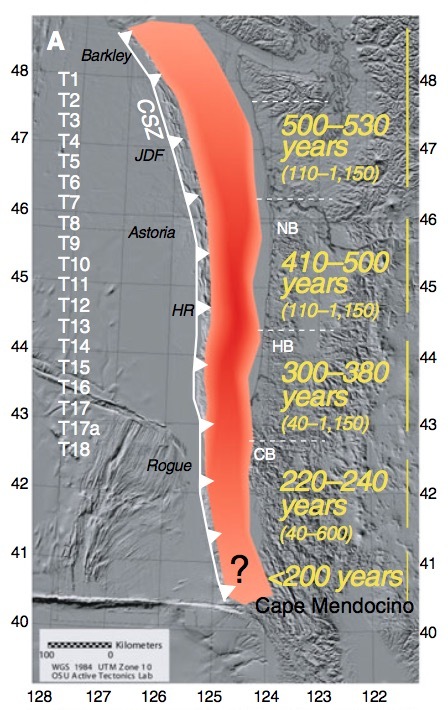 Failure analysis suggests that by the year 2060, Cascadia will have exceeded ~27 percent of Holocene recurrence intervals for the northern margin and 85 percent of recurrence intervals for the southern margin. The odds I cite in the [original] story are correct: there is a thirty-per-cent chance of the M8.0–8.6 Cascadia earthquake and a ten-per-cent chance of the M8.7–9.2 earthquake in the next fifty years. But from Seattle’s perspective, what will be our experience of a magnitude 8-8.6 earthquake, particularly one with an epicenter in Oregon? It’s not clear to me if the shake maps Schultz provides in her follow-up are for a full- or partial- rupture. The symmetry of the contours suggests they are for a full-margin rupture. We need clarification, or another model run (for the full Northwest region) of this most likely (30%) type of earthquake! Seem likely the next one will be big, not really, big, and maybe pretty soon? 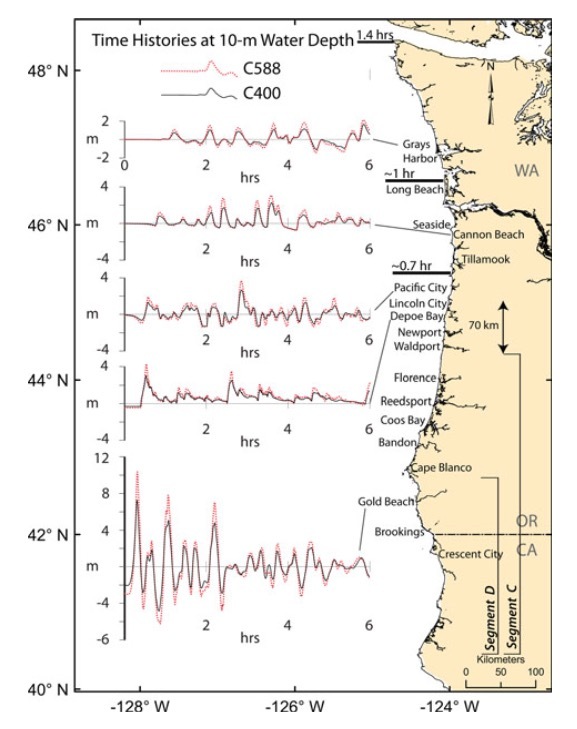 As the tsunami propagates northward, the maximum wave height deceases from ~10 meters near the epicenter to ~2 meters in northern coastal Washington. There is no tsunami risk in Seattle from a big or even a really big subduction earthquake. Despite all this scientific quibbling, I applaud Schultz on getting us all to be more prepared. Here in northeast Seattle, I plan to refresh our emergency plans and kits, and look into a seismic retrofit for our 1926 house.